Carnival Cruise Lines Gift Cards Now Available In More Than 9,000 Retail Locations Throughout The U.S.
Carnival Cruise Lines’ popular gift card program – a prepaid card that can be used as payment toward a “Fun Ship” vacation or a variety of shipboard purchases – is now available in more than 9,000 retail outlets throughout the U.S. This marks the first time that a cruise line-specific gift card has been made available at retail establishments ashore. Partnering with Blackhawk Network, a leading prepaid and payments network, Carnival will offer its gift cards at such locations as Giant Eagle, Kroger and Safeway beginning later this month. 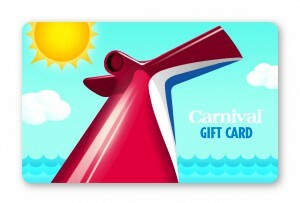 Also available online at www.carnivalgiftcards.com or sold on board Carnival’s ships, the gift cards are ideal for any occasion – from weddings and graduations to birthdays and anniversaries – and offer consumers flexibility and convenience in their vacation purchases. The cards can be pre-loaded with funds ranging from a minimum of $25 to a maximum of $1,000.